Kids love to imitate adults in many ways. Carrying bits and pieces around in their own little bags is one such example. 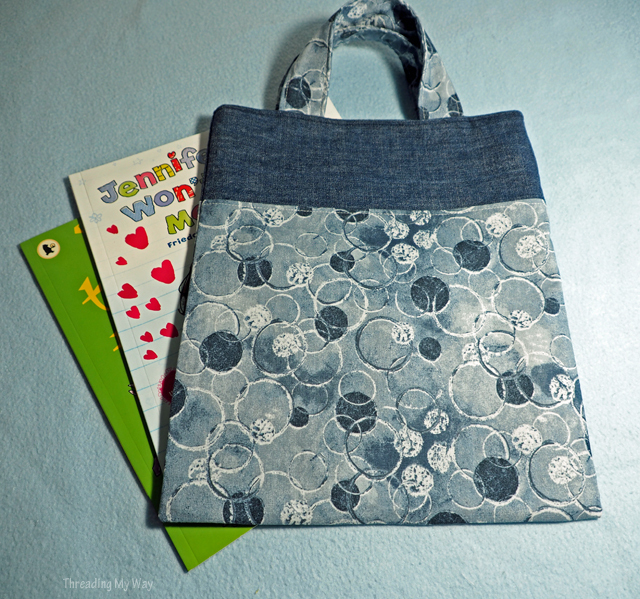 Today's tutorial will show you how to make a kid sized tote bag, utilising an old pair of jeans and some cotton fabric. 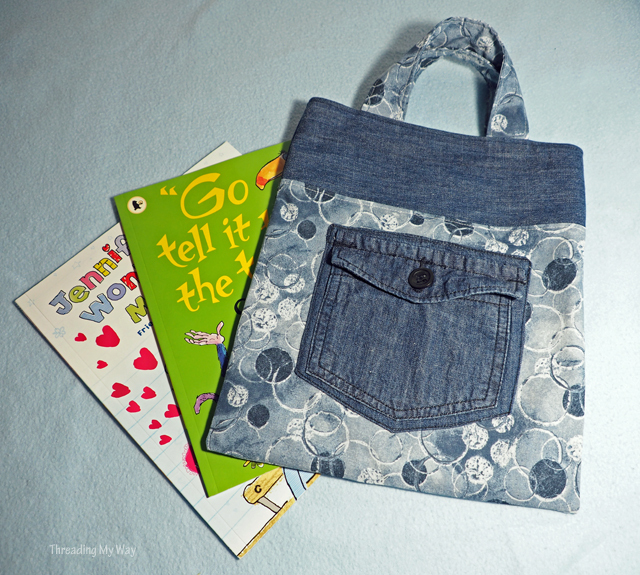 With a finished size of 10½" x 12½", the Jeans Pocket Tote Bag is larger than the Little Shopper Tote, and smaller than the Library Bag. Pocket from a pair of denim jeans. Leave roughly ¾" of jeans fabric attached to pocket on all sides. All seams are 3/8" (1cm), unless otherwise indicated. The seam allowance is not critical, as long as you are consistent throughout the project. Leave the pocket attached to the jeans. Cut roughly ¾" outside the edge of the pocket. Fold under ¼" on all edges. Baste (hand sew with a long running stitch) pocket to front of bag. 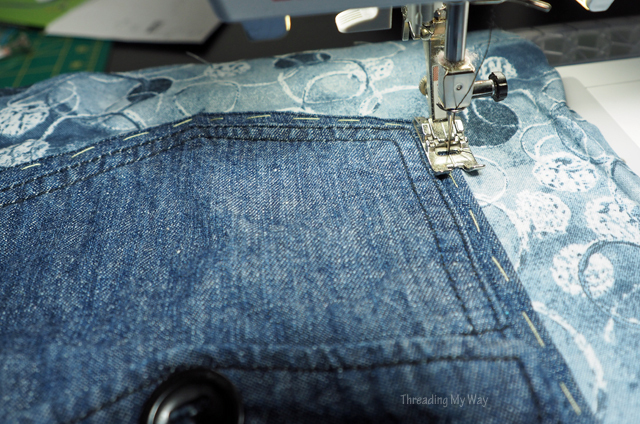 Stitching close to the edge of the denim, sew the pocket to the front of the bag. If pocket has any metal rivets, keep well away from machine needle. I totally forgot to record the position of the handles in my notes. I'm guessing I placed them about 2½" from the side seam. Try it and see what they look like. Make sure button is securely attached. Due to the button, this bag is not suitable for children under 3 years of age. If the recipient is younger than 3 years of age, or an older child who still puts things in their mouth, choose a pocket without a flap and button, and without any small metal rivets, etc. 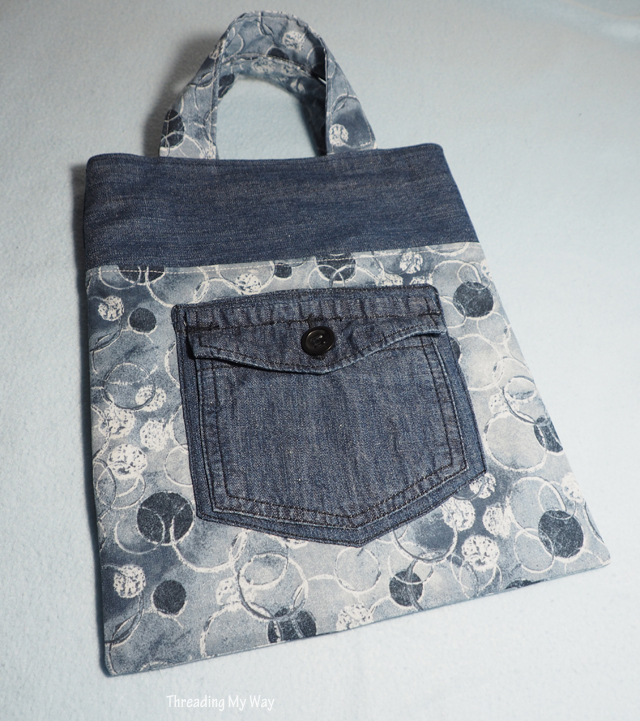 I only attached one jeans pocket, to the front of the tote, but you could easily add one to the back as well. Complete with a pair of matching shorts and a couple of picture books, this set has been sent off to the other side of the country for a young man celebrating his third birthday. 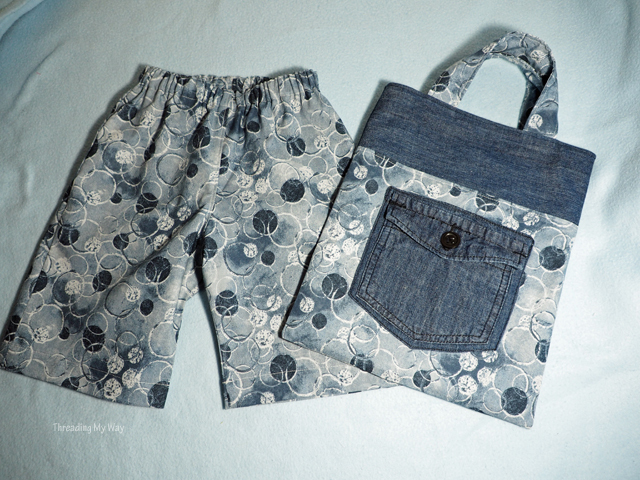 As I often do when sewing shorts, I used the Mud Puddle Splashers pattern, but it appears not to be available any more. I have to say, I am rather pleased with the the Denim Jeans Pocket Bag. 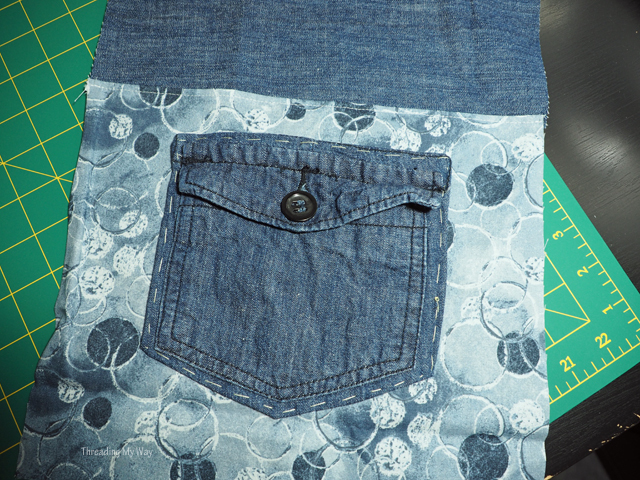 The upcycled jeans pocket works well with the cotton quilting fabric. I wouldn't mind playing with this combination and making a larger bag for myself. What projects have you made with jeans pockets? the bag for Kids ist very nice and practicabel. 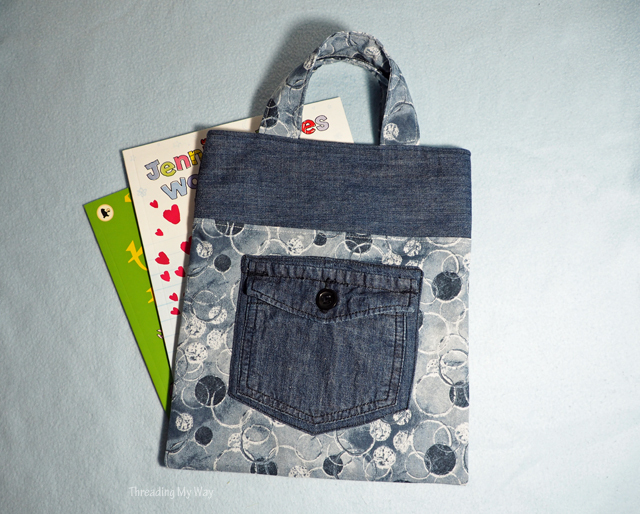 Cute bag and great way to use a blue jean pocket! Lovely looking bag! Thanks for sharing! When my kids were little, a lady at church always made these and presented the bag with a new box of crayons and coloring book. Always kept the kids quiet in church. Her bag didn't have the flap on the pocket. I like your idea to keep the crayons from escaping. Very cute, and looks like some very good instructions. Those big jeans pockets make great pot holders! would send a picture if I could!